We had our Blue & Gold banquet last night, and this was the main dish that we made. 1. Marinade pork in the dry rub overnight. 2. 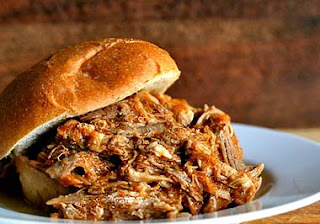 Bake the roast in 1/2 c. water & 1/2 c. sauce at 250 degrees for 4-5 hrs, or in your crock pot on LOW for 6-8 hrs. 3. Combine all ingredients for sauce & simmer 30-45 minutes, until thickened. 4. Pull pork & simmer in sauce for 1 more hour.